Unlike many, Harrington adapted well when standardisation of body designs by private car manufacturers in the twenties caused the decline of that part of activities. What work there was tended to be for bespoke chassis such as Bentley or Bugatti and this perhaps led to the upmarket image that Harrington continued to foster throughout their existence. In fact, cars continued to be a feature of Harrington work right up to the end of the company, but they were very much the minority. Production of luxury coach and bus bodies became the major occupation of the firm, with commercial vehicle bodies a smaller but significant proportion of the output. In 1930 a purpose-built factory known as Sackville Works was constructed at Old Shoreham Road, Hove. Not as bold as some new factories of the time the cement rendered facade could be described as falling somewhere between art nouveau and art deco. Displayed in large but elegant letters on one side was "Motor Coach Builders" and on the other side, "Automobile Engineers". The front was the narrowest part and the production area, of conventional construction, spread out behind, on the triangular site. The factory occupied an area of seven acres and by the late forties over six hundred employees staffed the works. The factory may have seemed grand at the time but from the start there was no room for expansion. A railway bound it to the rear and East, a major road to the front and there was a graveyard on the West flank. The site area always limited production to approximately 200 vehicles a year and would be one, although not the main reason that Harringtons ceased trading. As an aside, rather than the factory expanding, widening of the road ate into Harrington's frontage and the spot where many vehicles were photographed later became a very risky place to stand. During the Second World War, work other than war effort stopped completely. The very few passenger vehicles that emerged from the works may be presumed to be either repair of damaged vehicles or for supply to the armed forces. Harrington certainly constructed a number of special vehicles for Army, Navy and RAF and maintained others. Part of the works was converted to manufacture air frame components. It is believed that this was primarily for the Westland Lysander aircraft, famed for its ability to land and take off in a small area and much used in contacts with the French Resistance. Another activity where Harringtons were proud to contribute was the production of prototype aircraft components and this eventually became a major part of war work. The techniques such as light alloy construction and jig manufacture were incorporated into post-war coach production, thus ensuring quick and accurate assembly. Prototype work such as this continued even after the war and through the fifties. During the 1950s, a greater use of glass fibre was successfully applied to their products, thus saving on the costly panel beating process. The early process with its use of an oxidising catalyst was particularly risky with regard to fire or even minor explosion so the glass fibre components were constructed in a separate building behind the main works. Sometimes when curved repair panels for older coaches were required, a fibreglass alternative was supplied to replace the original aluminium one. By the early sixties, when the success of the Cavalier coach was resulting in batches of large orders, the limitations imposed by the factory size were becoming more and more apparent and Harrington once again turned to the car side of their business in an attempt to maximise production area. Fortunately eschewing the complete fibreglass replacement body so popular in the fifties, they started modifying production sports cars and making fibreglass "GT" conversions (the "fastback" top was part of the bodywork and was not intended to be removable). Base vehicles were the Sunbeam Alpine and Triumph TR4. Although hardly a GT, fibreglass was also extensively used in the PSV conversions to the Commer 1500 12 seater mini bus. These were particularly successful. For the purchaser, the attraction of this was that although the conversion cost more than the standard minibus, full PSV specification vehicles were excempt from purchase tax and this helped make the project viable. Commercial vehicle bodies were also produced but these tended to be very specialist in nature, with most bulk orders being Government contracts of some type. This had taken the form of specialised vehicles, such as a batch of Green Goddesses, Black Marias and RAF crew buses. Harrington had always been a family firm. Ernest G. Harrington and Thomas R. Harrington (the sons of the founder, Thomas) were Joint Managing Director and Chairman until 1960 and were very old indeed. (Thomas R. was 80 when he died in 1963). Arguably, in terms of business development things had been left to stagnate, but the small factory had always provided a good living. It would be wrong to be critical of this situation. The company had made the decision to continue within the limits set by its production facilities at Sackville works. There were other members of the family on the board; Clifford Harrington had been a joint director since the fifties in charge of coach building. It was Clifford who was keen to embrace the best continental influences and was the prime mover behind the styling of the Cavalier and Grenadier. However it was clear that things had to change. The bespoke work that had "filled in space" around the coach production was beginning to dry up. Harrington had been a Rootes agent since the thirties, the car dealership being run separately from the coach building side (there were showrooms in Hove and Worthing). The result of this special relationship was an intense interest when Harrington approached Rootes to see if there was anything they could do for them on the strength of their initial efforts with the Alpine conversion. It happened that Rootes were being lured into the exotic and expensive world of competition motoring and were looking for a closed body for an Alpine at Le Mans (presumably realising the Harrington output would enable it to be deemed a production model). Unfortunately dark clouds were beginning to gather over the Rootes Group which would have dire consequences for many companies associated with them. Contrary to an often reported story, Harrington never became part of the Rootes Group. Early in 1961 the Rootes family gained a financial stake when the Robins and Day group purchased Harrington. Robins and Day were owned by the Rootes family, but privately and outside the Rootes Group. As far as the Harrington family was concerned this should have provided a steady stream of specialist work from Rootes companies and potential for cash injection. Sadly, this was to be far from the case. Later there were some changes in management. George Hartwell came in to take charge of the Harrington Le Mans project. In November 1962, Desmond Rootes came on to the board as Director of Motor Trading. Clifford Harrington resigned from the board and left the firm. 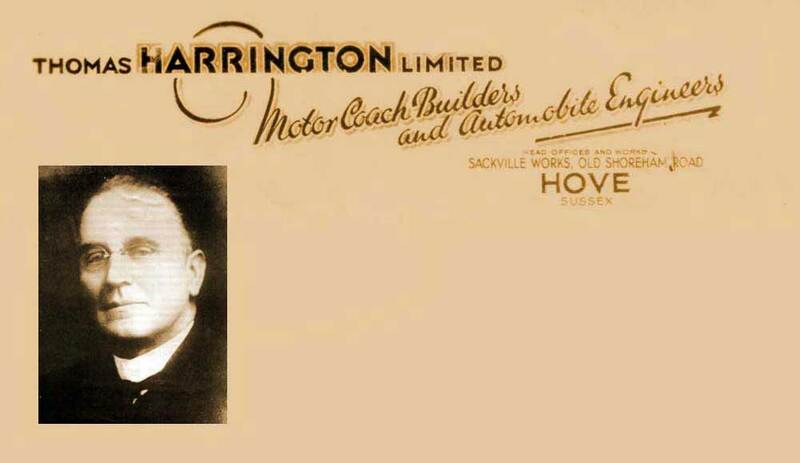 Gordon H. Harrington took his place as General Manager, Manufacturing (including coach building). At the same time Geoffrey Harrington was appointed to the Board as Sales Manager Manufacturing division. The time of the Harrington Alpine was about over by then (an expensive diversion for Rootes which together with the Le Mans programme fell victim to the 1960's recession). The coupe was deleted from the Alpine range in 1963. The conversions on the Commer minibus kept the Rootes connection ticking over until near the end and in fact after the closure of Sackville works, the fibre-glass conversions continued to be produced at Rootes in Maidstone although no longer badged as Harringtons. The firm was in a deadlock situation. As far as coaches were concerned no money was made available to develop new models, even though preliminary plans had been made for a replacement for the Cavalier / Grenadier range. The Crusader IV had seen a return to composite construction in order to reduce costs. It was also quite clear that the bespoke method of production that had served Harrington so well on its small site could no longer be made cost effective. The cynical might also draw comparisons to the asset stripping that claimed many well-respected names in the motor industry during the 50's and 60's - especially since Robbins & Day kept the Harrington car dealership sites running until the 1980s. Geoffrey Harrington had resigned in April 1965. Late in 1965 in was announced that coach-building activities would be discontinued in the following year. The last coach was body number 3218, a Grenadier registered FFJ 13D delivered to Greenslades Tours of Exeter. It took part in the 1966 Brighton Coach Rally. It no longer exists and it is believed that there was no particular feature on it that might have marked it as the last Harrington. Unfortunately on the closure of the works most of the archive material relating to bodies built and photographs and drawings were destroyed. Later it is reputed that Harrington's official photographer lost much of his saved material in a house burglary. It is unlikely that it will ever be possible to compile a complete record of all the vehicles that left Sackville Works, although Nynehead Books have produced a pictorial history of the Cavalier and Grenadier. The factory passed to British Telecom as a motor fleet service centre and was finally demolished in 1999. Plaxton took over the supply of repair panels for Harrington bodies and most of the fibreglass moulds went to Scarborough and in the fullness of time were scrapped. The Harrington name continued in motor sales, following the Rootes empire to Renault and then as BMW agents until the1980s.